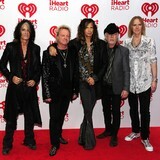 Aerosmith's upcoming world tour is reportedly in crisis amidst reports that band members are 'not really talking'. Sources claim that tension between frontman Steven Tyler and fellow rockers Joey Perry, Tom Hamilton, Brad Whitford and Joey Kramer has been increased due to poor record and ticket sales. The group's first release in ten years, Music From Another Dimension!, didn't meet expectations when it failed to climb to the top of the American charts. Meanwhile, none of the dates on their current Global Warming Tour have sold out. Rocker Steven is said to be laying blame for the mediocre reception of the record at the band's label's door. A second source commented that since Aerosmith fired former manager Tim Collins and A&R guy John Kalodner, the group has lost its 'magic'. Florida authorities say country singer Mindy McCready is missing with her 5-year-old son, and a judge has given her until Thursday to return the boy. The Department of Children and Families says a missing persons report was filed Tuesday night with Cape Coral police after McCready took her son Zander from her father's home. McCready doesn't have custody; her mother does. The singer was allowed to visit Zander at her father's home. DCF spokesman Terry Field told The Associated Press the agency requested an emergency pickup order, and a judge said McCready must return the boy by 5 p.m. Thursday. An Amber Alert has not been issued because officials and family members know McCready took him. Since topping the Billboard country charts in 1996 with her "Guys Do It All the Time," the 36-year-old singer's troubled life has been filled with domestic abuse, drug and DUI arrests and a suicide attempt. She appeared on VH1's "Celebrity Rehab With Dr. Drew" in 2010 and made headlines two years before when she revealed she had an affair with ex-MLB pitcher Roger Clemens. Users can store up to 20,000 songs on the Google cloud. After a summer of beta testing and months of rumors, Google officially launched its long-rumored Google Music service on Wednesday in an attempt to compete with the undisputed champion of digital downloading, Apple's iTunes. So far, Google has signed up three of the four major record labels -- Universal Music Group, Sony Music Entertainment and EMI -- but has not yet reached a deal with the Warner Music Group, which has a 20-percent share of the U.S. market. Among the Warner acts you won't find on Google Music are Wiz Khalifa, Nickelback, Frank Sinatra, Green Day, Gucci Mane and Mastodon. Google has signed up a number of independent labels as well and there was the vague promise of a potential Warner deal in the future. For now, though, the search giant is differentiating itself from the competition by allowing artists who self-release their music to directly upload their songs for purchase on Google Music and set their own pricing schemes. Google Music also lets users share the music they've bought with friends via the Google+ social networking platform. Once you've purchased a song or album from the Android Market, you can then send a stream to a pal using Google+ and they can listen to the tune once for free. The service, with prices similar to those on iTunes, will also be offering a free song of the day and is currently touting exclusive tracks from a number of artists, including Coldplay, the Rolling Stones and Busta Rhymes. Will you check out the Google Music service? Cowell delivered his list Tuesday afternoon during a conference call to promote the Sept. 21 premiere of 'X Factor' on Fox. During the call, Cowell was his customary self, declaring the show's superiority to NBC's 'The Voice,' stressing the 'X Factor's' back stories, praising Antonio 'L.A.' Reid and taking pot shots at Nicole Scherzinger and Paula Abdul. 'L.A. Reid is a revelation,' Cowell said of his fellow judge's TV work to date, which will air taped shows up until the first week of November. 'Nicole was (odd) in a fantastically self-centered way and she wasn't even aware of it. In every city she changes her accent. In New York City, she has a Brooklyn accent; in Dallas she has a twang. ('The Voice') didn't do it as well as us. I kind of expected them to -- that's the nature of the game. It's a necessary part of the format. Anyone can mentor, but can you mentor and create a star? You have to recognize what we have done (in the U.K.), where our third runner-up One Direction is going to have the (fastest-selling) single of the year.